A walkway needs to be easy to negotiate. But unless it's continuous paving, plants grow in the cracks. If they grow quite low, and stay mostly in the cracks, plants add a lot to a walk: they provide color and contrast; they soften the edges, both visually and metaphorically, of a hard surface; they add a note of rusticity, even romance. Some, like thymes, even smell good when you walk on them. When I built the path to our front door, I put thymes all along it among the big, flat stones. Since then, some of the thyme has died back (especially in low spots; thyme can't stand wet feet in winter); so I've put in other low plants. One of the best is silvery-leaved pussytoes (Antennaria dioica). It needs care to get established, but after that it's tough. In the shade, Sagina subulata (called Iris Moss though it's no moss) has volunteered. It makes a dense mat of the tiniest needle-like leaves, sprinkled with tiny white stars in June. I can't count how many plants of it I tried, in all kinds of conditions, losing them all  until finally it self-seeded itself in the path!. Plants that grow where their seeds sprouted are always stronger than transplants. Other plants also germinate between the stones of the walk. Johnny Jump-ups are particularly pretty because they start blooming when still tiny; I pull them up when they start to get a few inches tall. Dandelions get pulled right away, and grass, too. 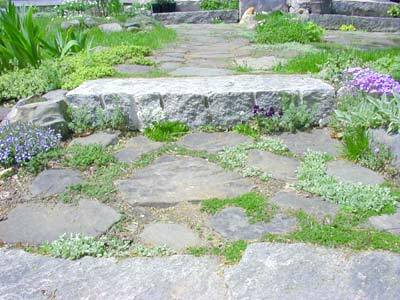 Grass looks good between path stones, but it chokes other plants out. This year a maiden pink has arrived, three little patches right in the middle. The mats of minute dark green leaves stay low, but the tiny magenta flowers rise up four inches on thin stalks. I can't stand to cut down their glowing color; I'm leaving them in the way till the flowers fade (a couple of weeks). 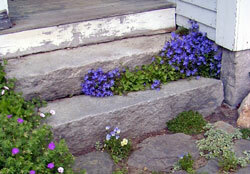 However I am going to cut back the Serbian bellflower that's all over the first step to the porch. Campanula poscharskyana is normally a diminutive creeper, with bright purple stars. Though reputed invasive, in my garden it sometimes dies without supplemental nitrogen. However, when I planted it in the cracks between the granite porch steps, and between the steps and the foundation, I gave it too much. That was two years ago, and it's still hogging almost half the step.